Versatility and flexibility make PFAs popular coatings. One reason PFA coating systems are so versatile is that they can be applied in the widest range of thicknesses for fluoropolymers. PFAs, or perfluoroalkoxies, are thermoplastics with the performance of PTFE, which means they can uniformly coat complex shapes with thin or thick films. The thickness that you apply PFA coatings depends on the substrate, the particular coating chemistry, and the primary coating properties you wish to achieve. Like most fluoropolymers, PFA coatings have high release capabilities and high corrosion protection for common consumer and industrial applications. PFA coatings are also used frequently for chemical resistance and electrical current resistance. PFAs are high-temp coatings that usually bake at over 650° F for a very pure and durable coating for high-use applications on common substrates such as aluminum, steel, and steel alloys. The range of thickness of the final coating, as always, is first determined by the limits of the particular chemistry of the coating you choose. However, PFA coatings can range from 3 to 40 mil maximum DFT (dry film thickness). This flexibility lets you choose the best option for your rank of the desirable properties such as abrasion resistance, smoothness, and permeation resistance. One property where there’s not as much flexibility is the color of PFA topcoats. That’s because most pigments aren’t stable at 700° F, which is what many PFA coatings bake at. The good news is that a number of PFA topcoats are clear, so you can often achieve a color by adding it with the primer. One application that makes the most of all of PFA’s best properties is on surgical instruments. The durability of the coating withstands the frequent cleaning cycles of surgical tools. PFA coatings also aid in electrical current dampening in instruments used for cauterizing tissue. It’s natural to assume that making the coating thicker will automatically make the coating more abrasion-resistant. However, that’s not always the case. A coating’s abrasion resistance properties are more dependent on the chemistry of the coating or on a specific additive in the coating. The range of optimum thickness is always specified by the coating manufacturer, usually on a data sheet. Another common issue with PFA coatings occurs when a coater thinks “thicker is always better” when applying the primer. Primers that are applied too thickly can be less adherent to the substrate. Perhaps the biggest lesson to learn about PFA is that the high curing temperature demands extra attention to the temperature of the items being coated. 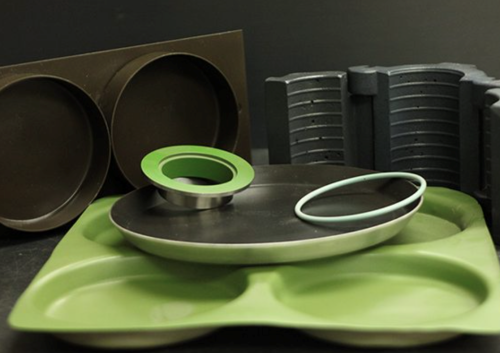 It is critical to bring the temperature of the parts up to 650° to achieve the optimum melt flow of the PFA coating and ensure the longest service life for that coating. Because there are so many factors to consider with PFAs, deep high-temp coatings experience is invaluable. We have many experts here at Crest Coating, who have decades of experience, and we pull knowledge from many different areas. Fill out this quick form today and we can help you select the right product for your job.